Every bride dreams of coming down the aisle to beautiful music. The harp not only offers an elegant alternative to traditional organ music, but it also can play in a great many more locations, both indoors and out. Most of the best-loved wedding repertoire can be artfully done on harp, and aside from enjoying the rich sound, your guests will be thrilled by the stunning visual of a harp welcoming them to the most important celebration of your life. 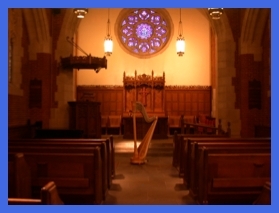 A typical solo harp wedding package includes prelude music as guests are seated; processional music for the family members, wedding party and the bride; candle lighting and/or communion music; the recessionals as the wedding party walks back up the aisle at the end; and a brief postlude as your guests clear the space and move on to the next portion of your event. 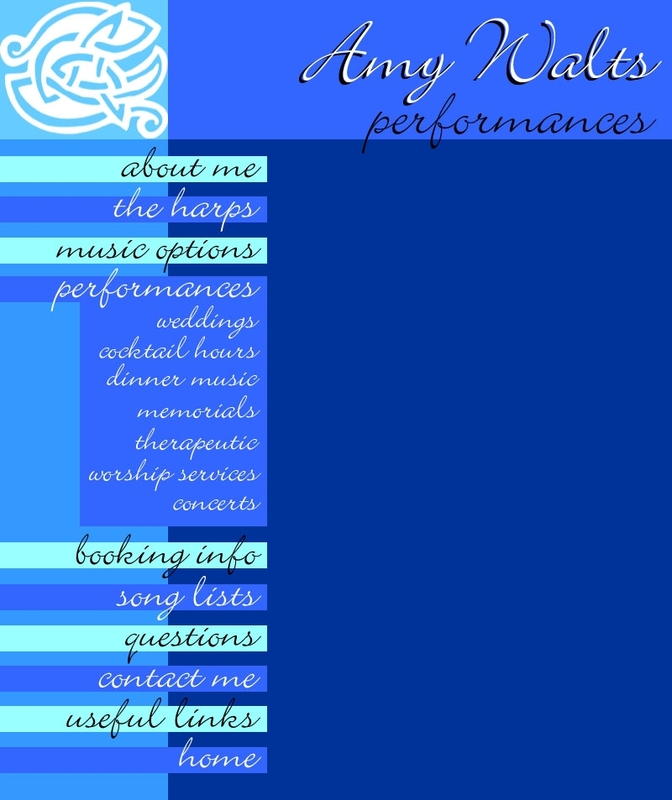 I often work alongside other musicians and vocalists for events; please contact me for details. I can also play piano for you. If your venue doesn’t have a piano but does have electricity, no problem: I have a really fabulous Yamaha electric grand piano that beautifully replicates several piano voices and several types of pipe organ. 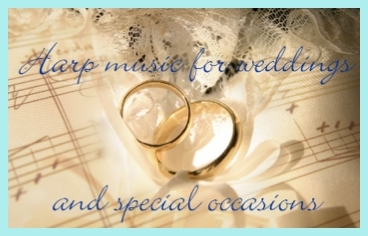 We will discuss your wedding instruments and selections in depth at a planning session. At cocktail hour, people are livelier and happier with music playing, just like at any other party, and the music often serves as a great conversation starter. Harp or piano is the subtle backdrop to all the conversation you want your guests to be able to have. I find the best approach to events like this is to combine music from as many different genres as possible; everyone will hear something that they like, and something that surprises them. It’s bound to keep your guests interested, and will make your event memorable! The harp is a beautiful way to celebrate the life -- and commemorate the passing-- of someone special and I have many musical suggestions for services of various faiths. Because a time of grieving does not lend itself well to spending much time choosing music, I can simplify the process for you with suggestions and would be happy to help you select music in an efficient and meaningful way. Never before has the scientific evidence behind music as a healing force in the body been so well-documented, and it is one of the fastest-growing fields in music and medicine today. Through the nationally-recognized Music for Healing and Transition Program, I trained as a Certified Music Practitioner; I have been taught to take specialized harp music directly to hospitals, care facilities, hospices and the bedsides of the critically and chronically ill.
Harp is a moving and spectacular addition to any worship service or celebration of faith: everything from being a special treat on a regular worship day, to a majestic addition to grand observances of Christmas, Easter, and observances of the saints (nothing like Irish harp for St. Patrick’s Day Mass)! 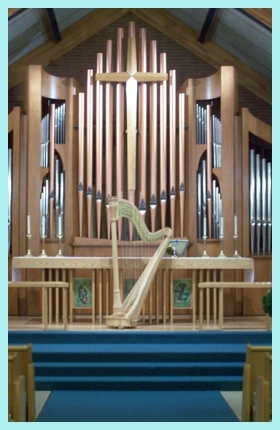 Baptisms, confirmations, communions, meditations... they are all perfect for harp. 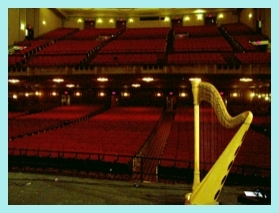 I do any number of styles of concerts, but am perhaps best known for my “presentation style events”, in which I combine harp music with the stories behind the songs, trivia about the harps, and interaction with audience members through an easy-going conversational style. These presentations are terrific for groups who are looking for entertainment to accompany a luncheon or dinner event and for organizations featuring performers as fundraisers. They can be tailored to suit any age group and can be custom-designed around themes. One of my most popular themes is Music from the Renaissance and Celtic Tradition (which can also be presented in lush period costume). I have also been featured as a performer at many of the local festivals for which Rochester and Western New York are so well known.